A small group of people from Brechin have recently been talking about providing a public information hub in Brechin, aware that – as digital technology increasingly takes over – some older people can feel left behind and unsure of how/where to access information. The group hoped to address this inequality by providing information that is easily accessible to all. We approached Brechin Community Pantry to discuss how and if we could share their premises on a trial basis which was greeted with warmth and enthusiasm. From August, great attempts were made to access existing community groups and networks to recruit new volunteers, to raise the profile and begin to build up a presence in Brechin. 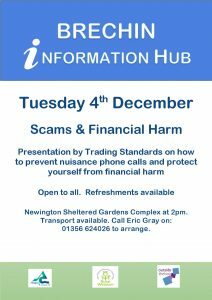 Due to a combination of factors, over the 7 weeks the Information Hub was manned and ready, we had a poor response to both enquiries and volunteer support. Sadly, the decision was taken on the 23rd Oct that it was difficult to sustain a weekly Information Hub with no volunteers and the decision was taken to stop with immediate effect. However, information is still key to many older people living an independent life for as long as possible and the Steering Group are moving ahead with their plans around hosting guest speaker slots on topics that matter to older people such as; scams, transport options, access to health services to name but a few and arrangements are now being put in place to hold the first of these public speaking slots starting in December. Alongside the launch of the hub, we planned an Open Doors Fortnight campaign as a chance for community groups and activities to throw open their doors to the wider community. This was an issue raised through the Survey Monkey exercise and Conversation Café event, held during May that local members did not know what was on, when it was on and who to contact. Read about the community groups and activities in Brechin here. Whilst it was recognised that the list was not comprehensive, it was a good start for sharing the impressive and diverse range of activities available to a wide range of ages and gender. This campaign was run during the 10-24 September, by issuing posters in local shops and newsagents, circulating leaflets to other community group organisers to share amongst their participants, and daily updates on local community Facebook pages. Anecdotal evidence identified that whilst new members joining groups was low, many felt it was a positive start to signposting people to the various activities and groups. Learning points were to provide groups with more time to participate, particularly those who used Church Halls. We appreciated the enthusiasm shown by local businesses in supporting this campaign. The group grows from strength to strength each week with new participants joining for a fortnightly afternoon of fun and friendship through the medium of song. Newington Gardens Sheltered Complex provides their big lounge along with refreshments facilities and easy access for all. 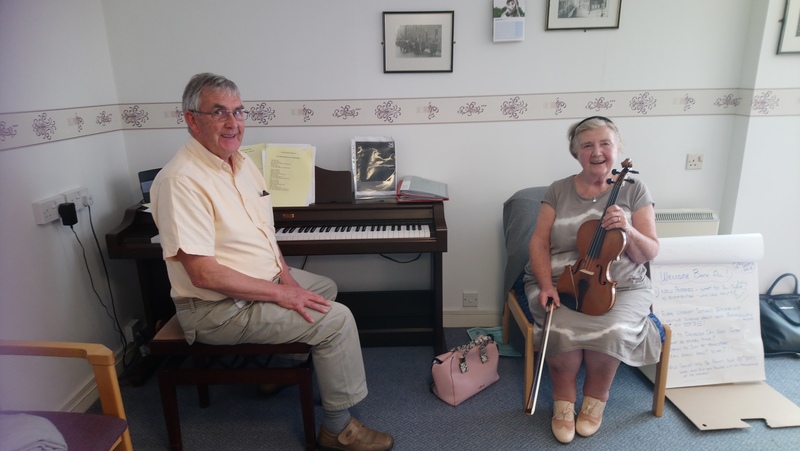 The group is very fortunate to have the musical skills of John Grubb, piano and Margaret Jamieson, violin who turn up to every group to help with musical accompaniment. Promotion of the group continues with members sharing posters and telling their own friends and family and whilst we are keen to attract other sheltered accommodation complexes to come along, the group decided to take the Community Singing Group out to them instead. 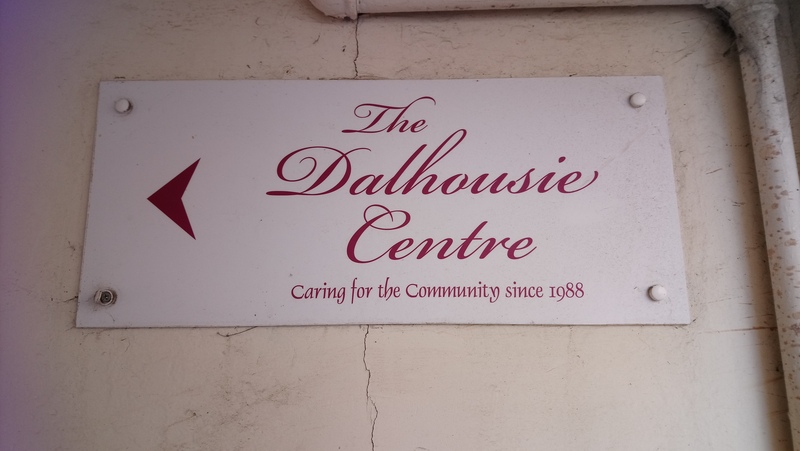 Our first one was held at Dalhousie Day Care Centre, a well-loved facility based in Brechin. The group discussed and agreed a programme of songs, most of which we already have in our library of favourite songs, ensuring that the Day Care members could participate as much as possible. A jolly afternoon was had by all, with full participation from members, Community Singing Group and care staff where we were treated to homemade scones and jam! The Community Singing Group membership now stands around 16 members and will finish this season with a Christmas Carol and Buffet afternoon on Thursday 6th December at Newington Gardens. Shona, our RW Development Worker was invited to attend a regular WRI Tarfside Meeting, as a Guest Speaker held in the Masonic Hall. Glenesk is an area which is approx. 12 miles on single track road from Edzell and whilst beautiful is very remote from towns and services. With the recent school closure, new estate ownership and older people moving out of the area to access health and social care, (internet/mobile phone signal not the best!) the area is facing significant changes in its social demographic. The WRI in Tarfside continue to offer regular get togethers not just for themselves, but for others in their community but are faced with declining involvement. Shona provided an outline of the work of Rural Wisdom, shared information, resources and provided ideas on how to increase participation levels such as the ‘Chatty Café’ scheme. In return, we were asked to be the judge for the ‘Limerick Competition’ with the theme being on ‘Community’ and the winning ditty is below for your delectation and delight. Rural, Masons Ball, haggis, neeps n tatties, braw! Book Club, where, when, monthly? Come along to an afternoon of activities celebrating inter-generational relationships through the medium of film! Rural Wisdom has been working with older people and the p7’s at the Edzell Primary School to put together a short film about the power of inter-generational relationships. We want to invite you to our festival showcasing their work and offering an opportunity to ask questions and share your ideas. We will also be hosting an inter-generational cake baking competition (bring along a cake you’ve made with someone of a different generation to be in with a chance of winning), a film quiz, and screening of Pixar’s inter-generational epic movie – UP! 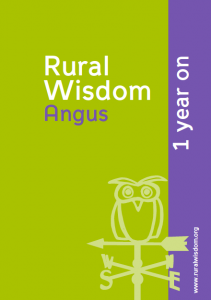 The Rural Wisdom project began in 2017, and over one year into the project, we took the time to reflect on what has been achieved and what is yet to be done. Read more. 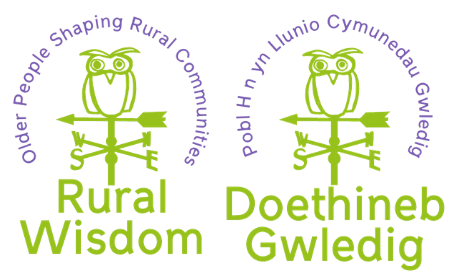 On the 18th January in Lesser Hall, City Hall, Brechin, Rural Wisdom will be hosting a meeting in Brechin to consider what comes next for the area. It will run from 10:30am to 3pm, for more detail contact: shona@otbds.org.